Parents tend to have significantly different attitudes when it comes to caring for baby teeth. Some parents give great care to baby teeth, they get worried if their child didn’t start teething yet, they’re worried about the appearance of black spots on baby teeth, however, on the other hand we can sometimes hear the opinion that baby teeth aren’t important thanks to which some parents don’t care about their child’s teeth at all, in that period. In this article we’ll clarify whether baby teeth are important and why. Baby teeth are very important and it would be perfect if we could keep them healthy until the moment when they’re replaced by permanent teeth. To begin with, they have a big role in the development of both jaws. Through their growth they stimulate bone development and also ‘protect’ the space for their successors, permanent teeth. Due to these reasons it’s important to treat and care for baby teeth. When Should You Visit the Dentist for the First Time? The best age for visiting the dentist for the first time is between 2,5 and 3 years, and it doesn’t matter whether there are any cavities or not. In fact it would be better if all the teeth were healthy. The worst solution is waiting for a cavity to cause pain and then visiting the dentist. In this case the child is already scared and in addition to that, they’re meeting the dentist as a person and a therapist for the first time. In these types of situations the cooperation and the possibility to do something is usually made difficult and sometimes impossible. 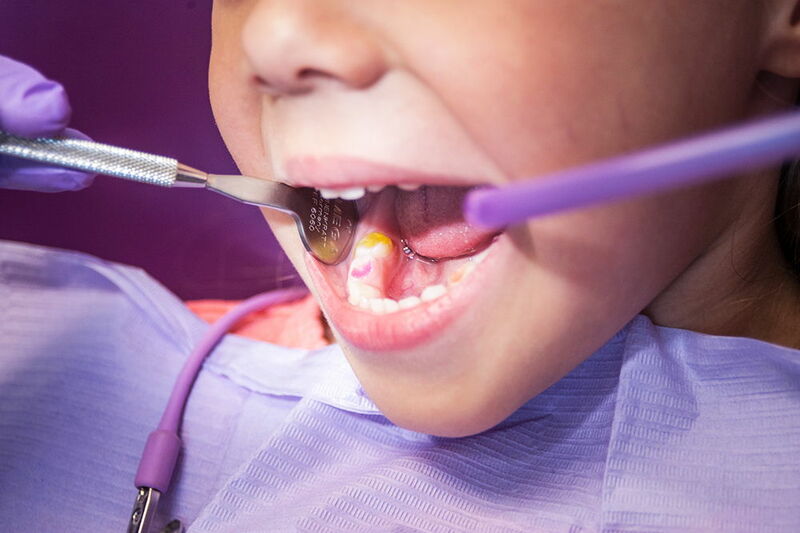 This is the reason why it would be best if you could bring the child to the clinic in the period between 2,5 to 3 years of age, so the child could get to know the atmosphere in the clinic, feel comfortable in that environment, and accept the dentist as a familiar person or even better, a friend. When these conditions are fulfilled, the cooperation is easier to achieve and the child is more likely to visit the dentist without problems which makes the whole situation easier for the parents as well. With regular visits to the dentist there are less significant problems; the teeth are treated more quickly and so the child goes through the whole ordeal much easier. Maintaining dental hygiene should start very early, when the child reaches its first birthday. Through playing you should teach the child to brush teeth with toothpaste that has fluoride. Why exactly fluoride? Through more than 30 years of researching the use of fluoride, scientist reached the conclusion that it is the most efficient tool in the prevention and fight against cavity. Namely, fluoride functions in a several ways. To begin with, it lowers the solubility of hard dental tissues (it ‚strengthens the dental enamel’), and as you know, cavity occurs when the dental enamel is damaged so when you use fluoride you protect against cavities. If the demineralization processes (enamel dissolving) already began, fluoride can accelerate the re-mineralization process (restoration of the enamel), it prevents plaque formation as a starting process that leads to cavity and finally, it lowers the density of saliva which makes it more liquid and in that way it cleans the dental surfaces better. In addition to using toothpastes, it’s also necessary to start early with the application of the amine fluoride solutions (that also contain fluoride) or other solutions on the market with a similar effect. These types of solutions should be used once a week by coating the teeth in the evening after the regular brushing. After that the child should go to sleep without rinsing its mouth. There are 20 baby teeth altogether, 10 in every jaw. They emerge in the period from 6 months to 2,5 years of age. We’ll try to shortly describe the order of teething, but it’s necessary to keep in mind that this is an individual process and there are exceptions to this timeline. If you’re concerned about the absence of teeth or their late emergence you can always ask your dentist about this. The dentist is likely to explain the situation and relive you of any worry. The child gets its first central incisors between the 4th and the 10th month of life and make note that the upper incisors usually emerge first. Shortly after that, the lateral incisors emerge as well, in the same order. After a break of 3-4 months, first lower and upper molars break out after which come the canine teeth and finally between 19 and 30 months second baby molars emerge. Usually there is some empty space between baby teeth which you shouldn’t be concerned about. This is a normal occurrence and a preferable one, since permanent teeth are wider than baby teeth and this space compensates for smaller and narrower baby teeth. After emerging, baby teeth should be kept healthy until they’re replaced by permanent teeth which usually starts in the 6th and lasts until the 12th year of life.